I'm trying to syncronise a folder in my FTP server with a local folder. So, I use scripting method. 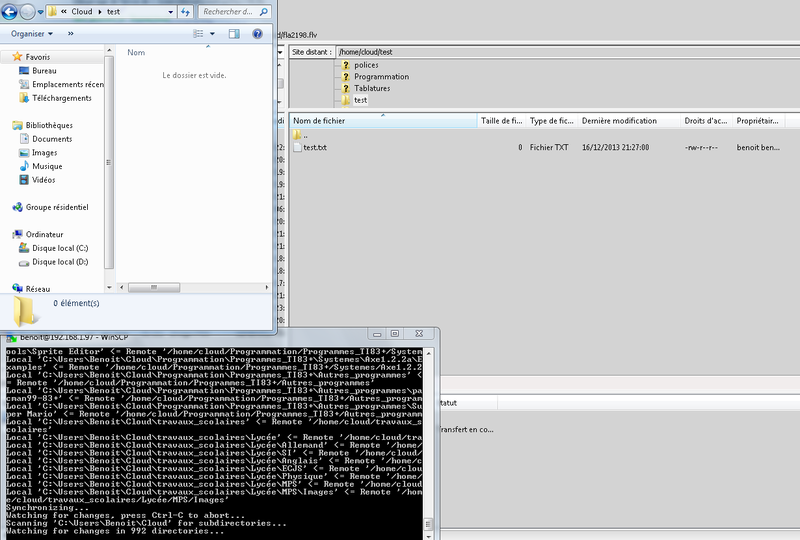 synchronize local -mirror -delete "C:\Users\Benoit\Cloud" "/home/cloud"
As you can see, I start an update of my local folder from the server and then, I keep up to date the server with the local folder. At least, It detect that I modify the folder... but doesn't upload. I created my own account. The file is compressed in the attachment. When I post this one, it proposed to me to consider to repost the topic without external link and by using attachment. Description: The log file compressed. Thanks. But I need a log file for a session, when a change happens. I do not see any Change in ... detected record in the log. Ok, I do it again. 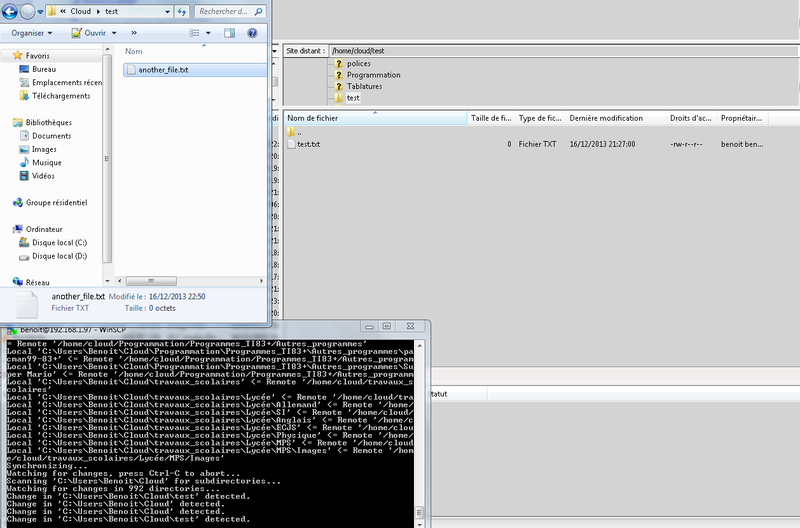 I add a file called "test_file_from_remote.txt" in the remote "/home/benoit/cloud/test/". > 2013-12-19 19:10:04.972 Script: keepuptodate -delete -transfer=automatic -filemask=|films/;__pycache__/ "C:\Users\Benoit\Cloud" "/home/cloud"
< 2013-12-19 19:15:38.085 Script: Change in 'C:\Users\Benoit\Cloud' detected. < 2013-12-19 19:15:38.610 Script: Change in 'C:\Users\Benoit\Cloud\test' detected.
. 2013-12-19 19:15:38.624 Deleting file "/home/cloud/test/test_file_from_remote.txt". Finally, none of these files are transfered. You can donwload the full logs in attachment and looking around lines 36 8xx for all informations. With the last version (550) of WinSCP, my problem is solved. Thanks ! I suppose that you run 5.5 with different configuration (INI file). Indeed, it was the problem !